If your dog has liver diseases, consider his diet. This is an important treatment tool for him. Your dog may need a dietary change to help the liver regenerate. Also, this helps to maintain good canine nutrition. To help you understand exactly about this common problem, we are here to give you all the important information about it. We also give you the list of best dog foods for liver disease. This condition is common in dogs. This problem may give the result in non-accidental canine deaths. You know, the liver has the function of removing waste and toxins. Also, it produces bile for your pet’s digestive process. So, if you let it be compromised, the number of toxins and waste may be increased in your pet’s body. It also means that it can affect a wide range of other bodily systems like the heart or brain. Like any other health condition your dog can suffer from, liver disease is accompanied by some common symptoms. They include weakness, fatigue, depression, appetite loss, weight loss, stomach pain, and vomiting. Once you notice your dog is suffering from these symptoms, it’s time to consider taking him to your vet for a checkup and diagnosis. Like being said that, it’s extremely important to make a change in diet for dogs that are suffering from liver disease. To do this, you need to do specific steps with his daily eating regimen. Of course, it’s also important to talk to your vet first to determine your dog’s specific needs. Your vet can recommend you to feed your pet a diet based on home cook meals, prepared meals, or both of them. If your dog has to face liver diseases, you will want to know what to feed him. Remember that it’s best to discuss with your vet about all significant diet changes. This problem should not be treated if you don’t have medical guidance. You can get a dietary plan for your pet with liver disease from your vet. Give your pet the right nutrition in order to help him maintain energy and health. Promote liver At the same time, don’t forget to minimize stress on his organ. Potential complications should be prevented and reduced. If you want to make foods for your dog yourself, remember that you should feed him at least 50% of the meat. Also, the number of carbs and grains should be kept under 50%. In order to determine the number of foods to feed your dog, you need to determine his body weight. Then, feed your pet accordingly. According to Dr.Jean Dodds, we should give our pets a diet with a 50/50 mix of sweet potatoes and white potatoes. Make a mixture of fish and potato as the ratio 1:2. Cooked chopped carrots should be also added to your pet’s diet. Moreover, you can add scrambled eggs, green beans, and yellow squash to his diet. Dairy products, including yogurt, cottage cheese, ricotta cheese, and goat cheese. High-quality proteins from turkey and chicken. Avoid the fish, eggs, and bones in the diet. White rice, oatmeal, canned plain pumpkin, and barley. They offer essential fiber. Fruits, including figs, papayas, blueberries, and seedless watermelon. For dogs with liver disease, you need to monitor his protein intake. Look for the high-quality proteins. Some of the protein may be sourced from non-meat sources. The proteins you give your dog should come with enough amino acid for his digestion. In addition, you can also consider plant-based proteins. Most importantly, remember to give your pet less protein in order to control the symptoms of liver disease. Some animal proteins are available in high levels of copper. Therefore, you have to be careful when choosing the best dog foods for liver disease. It’s best to avoid these proteins. Especially, it’s vital to avoid liver and organ meat. Some other meats with high levels of copper include lamb, duck, pork, and salmon. However, there are also protein sources that are low in copper such as chicken, turkey, beef, eggs, whitefish, and cheese. If there is a high level of fat in your dog’s diet, he may suffer from liver disease. So, it’s best to give these dogs a diet with 50% fat content. This factor is important for your pet digestion. So, it’s essential to add fiber to his diet. At the same time, remove ammonia. Carbohydrates may be found in cooked oatmeal, pasta, and white rice. You should give dogs with liver disease a low-salt diet. This is to prevent the fluid in the abdomen from building up. There are some great supplements to consider such as vitamin B complex, vitamin E, C, K, Zinc, and Adenosylmethionine. The liver is one of the most important parts of your dog’s body. It comes with many functions. This is good dry dog food for dogs with liver disease. It can help support his liver health. It is made out of vitamins E&C, digestible protein, and reduced sodium. Therefore, you can feed your pet this recipe. There is no concern about added supplements. This product is designed to help reduce liver workload. So, your dog’s liver tissue can regenerate. Also, it helps to maintain normal fat metabolism in his liver. Moreover, with this dog food, you needn’t worry about nutrient deficiencies commonly that may lead to liver issues. Last, it can be able to support your dog’s immune system. This version from Hill Prescription is made with the same benefits as the dry version mentioned above. However, this dog food is designed in a softer texture than another. It’s made to support your dog’s liver function. It can help to maintain normal fat metabolism in the liver. Sure, your pet will love to eat because it’s a palatable formula. This dog food is low in copper and sodium content. It’s added with boosted zinc and vitamin B. this is a good choice for your dog’s digestion because of its fiber content. The food actually does vegetable protein for your dog. We also have the Royal Canin Canine Hepatic Can with the same benefits as this version. However, it’s designed in a softer texture. This dog food is one of the best options for liver disease. It’s formulated with many natural ingredients. It is made of the real meat protein. It’s free of grains. Instead, it features plenty of vitamins and minerals. Also, the food is added with antioxidants. It ensures to give all the essential proteins your dog needs from chicken meal, deboned chicken, and turkey meal. Also, it provides healthy complex carbohydrates sourced from peas, sweet potatoes, and potatoes. Furthermore, the food is available in antioxidants from cranberries, blueberries, and carrots. The food is built up with simple ingredients. Actually, the recipe is formulated with chicken protein, vitamin E, zinc, and without sodium. It’s made with cage-free turkey and dehydrated. So, it ensures to give your pet the maximum nutrition. This option is great for both puppies and active adults of all sizes. The food is formulated with human grade ingredients without preservatives. Especially, you can mix it with water for a delicious meal. The food is free of preservatives, by-products, and GMO ingredients. All of the ingredients are made in the USA. If you are looking for a product that is rich in vitamins and minerals, you can choose this dog food. This food promises to give your little furry friend a great tasting because it’s made of grain-free, high protein, and freeze-dried raw coated kibble. Feed your pet this recipe. And, he can get a naturally nutrient-rich diet. You can feed the food for even smaller mouths because of the addition of the perfect kibble size. This option is balanced levels of proteins, calories, and fats. That makes it great for the lifestyle of toy breed dogs. It’s added with healthy omega 3 fatty acids. So, your pet can get a soft and shiny coat. In addition, you can find added vitamins and minerals in this recipe. There is no existence of grain, gluten, wheat, corn, soy, fillers, flavors, artificial colors, and preservatives. These ingredients can help to cleanse the liver. On the contrary, food is low in copper and sodium. Once again, it’s important for every pet owner to read the label of dog foods before making a buying decision. In fact, it will be difficult for your pet with liver disease if you don’t choose dog foods with the right supplements for liver disease. If your dog is suffering from this condition, you can take close attention to our recommendations above. They can help a lot. If your dog has kidney disease, you will surely feel lost. In fact, many dogs have to face this problem. Your dog can still live a happy life if he has kidney disease. So, don’t worry! In order to help your pet feel better, it’s important to give him the right diet. You can look for a diet that can control his symptoms of kidney disease. It may be not easy to change your dog food right away. This may become easier if you have a little bit of planning. We are here today to help you choose the right dog foods for your pet when he has kidney disease. Keep reading this article to learn about them. Lower in protein: during the early stages of the disease, we recommend you to give your pet slightly higher protein. It’s essential to give him lower protein if he has advanced kidney failure. High in water: it’s really important to give your dog enough water once he has any kidney problem. That’s also why we recommend you to choose the canned dog foods in place of dry dog foods. Of course, canned dog foods contain more water. If you want, you can also mix your dog’s food with water or different wet foods to help him get enough water in his diet. Reduced sodium and phosphorus levels: this is necessary for the right kidney function. In fact, a higher amount can cause hyperphosphatemia. Increased omega 3 fatty acids: this factor plays an important role in your dog’s diet. Indeed, it can reduce inflammation in dogs. Also, it’s great for your dog’s overall health. So, when choosing the best dog foods for kidney problems, consider ones made with fish oil. In order to help you narrow your decision between a variety of dog foods for kidney problems out there, we’ll list the best choices below. If your dog is keen on eating dry dog foods most, you can feed him this food. This kibble is actually low in sodium, protein, and phosphorus, but rich in other micronutrients. It’s easy to digest. This is really a good option for owners who are looking for safe and tasty dog foods for their pets. Like being said that, this food is low in protein. This content only makes up 14%. It comes with high-quality animal protein sources. They include deboned chicken, peas, potatoes, sweet potatoes, pea protein, and other veggies. In addition, it contains flaxseed for omega 3& 6 fatty acids. It also is packed with vitamins and minerals. So, it’s perfect for dogs with sensitive stomachs. This is a good consideration for those who are finding a moist-low protein dog food. It can help to support your dog’s overall health. This is also a great option for dogs with kidney disease because of its high-quality ingredients. Water is listed as the first ingredient of this canned dog food which makes it become one of the best choices for kidney disease. Besides, the food also contains real beef, some whole grain corn, and cracked pearled barley. In fact, the food only offers 4% protein. This is a good quality animal protein sourced from beef, fish meal, pork liver, corn, and dried whey. Moreover, the formula features all the essential vitamins and minerals. If you have a dog with kidney disease, you need to avoid choosing dog foods that rich in protein. Also, pay more attention to wet dog foods in place of dry formulations because they have much more water. That’s why this dog food recipe is listed here. Many pet owners choose this brand because it’s not only great for kidney disease but also budget-friendly. It can help to support kidney function and health since it is packed with a reduced amount of phosphorus. Like the previous mentioning, the food contains water known as the first ingredient. The main source of protein is chicken. it also ensures to give your four-leg friend healthy skin and a shiny coat as there are some rice, fish oil, corn, and dried beef in the ingredients. Plus, the food is formulated with necessary vitamins and minerals for complete nutrition your dog needs every day. If you are in difficulty when choosing tasty dog foods for kidney health, check out this dog food brand. It’s greatly made to support canine’s urinary health. The food is built up with low amounts of protein as well as reduced magnesium levels. So, it’s a good solution for most dogs with kidney disease. This recipe allows you to mix with water or other wet dog foods. The third ingredient is animal-based protein. Corn and brewer rice are the first two ingredients. Also, the food contains other ingredients such as eggs, chicken fats, and fish oil. They play an important role in improving your dog’s coat and skin. This recipe is added with vitamins and minerals as well. They are necessary for an adult dog to be healthy. When choosing dog foods for kidney disease, consider ones that are low in protein but high in fat. These foods are also great to give your dog high-energy levels. This formula is formulated to improve canine kidney function as well as improve the quality of their life. This is a delicious food with ingredients such as pork fat, brown and brewer rice, whole grain sorghum, barley, chicken, and more. So, it’s also easy to digest and nutritious. In addition, there is fish oil for omega 3 fatty acids. Plus, there are additional supplements to build a balanced daily diet for your pet. This is actually a great kidney care diet thanks to sodium and phosphorus content. This is a dry dog food from Purina for dogs that love to eat kibble over wet foods. It’s also formulated with the right amount of protein and phosphorus. This is really a good option for kidney problems in dogs. In fact, it can be able to help support your dog’s renal health. It ensures to give him optimal nutrition. This dog food is made with no meat-based protein sources. It contains whole grains, including eggs, corn, rice, as well as dried whey. Moreover, it supplies omega 3 & 6 fatty acids for your pet’s overall health. Like others mentioned above, this recipe also contains added vitamins and minerals. Therefore, this food features complete nutrition for your pet. You can mix this recipe with water as well as different kidney-friendly wet dog foods. If you see some signs of kidney diseases on your dog, stop feeding him meat-based dog foods immediately. This is a good choice from Royal Canin. It is packed with no meat protein. Instead, it contains quality vegetable-based protein. Therefore, this recipe is easy to digest on your dog’s stomach. This formula features a precise blend of nutrients. Indeed, it can provide your pet with a lowered amount of copper while it can still provide him with a complete and balanced nutrient that all adult dogs need. The recipe contains corn, brewers, and brown rice in addition to other ingredients such as fish oil, vegetables, and chicken fat. Also, it offers omega 3 & 6 fatty acids for your pet’s coat and skin health. There are also added vitamins and minerals for a complete nutrition. It allows you to serve alone. Also, you can mix it with water if you want. From this formula, your dog can also get L-carnitine to maintain a healthy weight. If your dog needs a food that can help support his kidney health, you can try feeding him this product. It’s made with optimal nutrient levels. In fact, it is low in phosphorus, sodium, and protein. However, it is rich in antioxidants. In addition, this food is formulated with natural flavors that are necessary for dogs with kidney diseases. The food only offers your dog 10.5% protein. So, this is a dog food with the lowest amount of protein on our list. Its four first ingredients include brown and white rice, corn, and chicken. The next ingredient is chicken by-product meal. It can help to improve your dog’s overall health because of the omega 3 fatty acids in ingredients. Also, the food is built up with all essential vitamins and minerals, which makes it becomes a complete and balanced diet. Though this dog food is available in low amounts of protein, it contains quality animal protein. This is a good choice for dogs with kidney diseases. This food can support kidney health effectively. At the same time, it can improve as well as length quality of your dog’s life. This formula is low in protein, phosphorus, and sodium. On the contrary, it’s high in fiber and healthy fats. Water is known as the first ingredient of this recipe. And, it’s accompanied by carrots and real beef. There are also some other ingredients such as dried eggs, rice, flaxseed, and dried beet pulp. They can help to raise the nutrient as well as antioxidant content. There is also fish oil that helps to boost the fat content. Also, this ingredient is beneficial to your dog’s coat and skin health. Furthermore, the food is packed with all important vitamins, minerals, and L-carnitine. You can feed your pet this food alone. You can also mix it with other dog foods your pup loves. Now, you have an overview of the best dog foods for kidney diseases. You see, they include both dry and wet dog foods. Some pet owners choose to mix kidney disease dog foods with regular kibbles to reduce their cost. Dog foods specially made for kidney diseases are actually more suitable for kidney problems when compared to regular dog foods. When feeding your dog, you can mix your dog’s food with different ones. However, don’t forget to let your pet get enough water. All of the products mentioned above are great for kidney problems. They promise to keep your dog live longer and healthier. It’s important to train a dog regardless of breed. If you get a French Bulldog Puppy home, it may be difficult to train him. Although your Bulldog is smart, he is also a little stubborn. Fortunately, you can do well your responsibility with a little patience, practice, and kindness. Sure, your dog will be a good companion. Read this article to learn how to raise a French Bulldog Puppy. Don’t allow him to get familiar with toileting indoors once you want him to do this outside. If you want your dog to toilet in your yard, you should take him to the spot right away. Let your dog sniff around the yard until he defecates. Then, you can go to your home. To make your dog become a good household member, it’s best to train him as soon as possible. The thing you need is to be very consistent. In addition, it’s important to encourage your dog when housebreaking him. You need to learn about your dog’s specific signs. Also, it’s great to make him the habit of frequently opportunity to toilet. There are some signs you need to know such as panting, barking, pacing or sniffing around the house, and wandering off to a quiet area. You should know when your dog needs to toilet otherwise he will go in the house. It requires you to clean up messes immediately. It’s essential to use a product designed for pet messes. This will help you to remove the scent of urine completely. Remember not to scold or hit him because of this accident. This can make him not to trust you. Prepare a crate that has to be large enough for your dog. It’s important to let him grow into its full adult size. Also, make sure he can turn around comfortably. If you want to housebreak your dog, it’s best to use a crate. We recommend you to set up the crate with a soft blanket in the bottom. In order to encourage him, a great way is to give him a few healthy treats in the crate. However, you shouldn’t leave water in the crate. It’s great to put it in somewhere quiet. Don’t make him feel isolated or punished when you put him in it. Encourage your dog to enter the crate by keeping the kennel door opened. You should leave him in the crate for 10 minutes. It’s better to sit near him during this time. Let him out when he’s quiet. It’s a great idea to keep him here for longer periods of time. In fact, if you have an older dog, you can leave him in the crate for up to 4 hours. But, don’t leave him here for longer. In addition, avoid using it as a punishment. You need to make your French bulldog puppy become a part of your household right after getting him. It’s not essential to shield your Bulldog from energetic family members as well as noisy activities. The thing you need to do is just make sure they are non-threatening. Make sure your dog feels comfortable with riding in vehicles. This is also a great way to introduce him street sights and sounds outside. Use a harness or carrier in order to protect your dog safe when you are driving. The park you choose has to allow him to play with other dogs and humans. This is also a great way to help him burn off some energy. Most importantly, he had two first distemper vaccines before you take him to the park. A young bulldog requires a 5-minute training session. Then, increase the time gradually over time. It’s best to do 3 to 5 training sessions per day. Avoid training him when he feels tired or hungry. This can make him lose focus on learning. More importantly, you have to be consistent and patient with him. It’s very important when you want him not to chew or bite. If you see your dog do these things, you should say “No chew”. And then, give him an acceptable chew toy. Continue to teach him what he can chew. Let your dog stand in front of you. Then, bring a treat so that your dog can see it. Next, say “sit” with a friendly voice. Sometimes, he may jump to your attention. You will have to keep him on a leash. This way can help you to correct your dog’s behavior. You can say “come” when your dog is sniffing around or playing. Then, your dog surely runs over to play with you. You should give him a lot of praise or a treat when he can do this. This command is used when your dog does a dangerous thing. It’s essential to practice it at different times. A great method to silence your dog is using a bag of treats handy. Once he barks, say “quiet.” If he knows that he needs to stop barking and does that, let’s give him the reward immediately. Train your dog to link a clicking sound from a clicker device. You can give him this clicker as the reward for following a command. Sure, your dog will correct his behavior thanks to the clicker sound. And then, you can wean him off the treats if he gets used to the clicker. 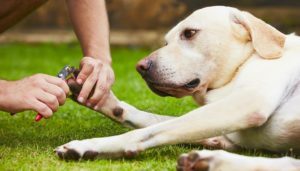 When it comes to taking care of your dogs, there are many things you can do: taking him on a walk, exercising, playing with him, and so on. However, did you know that grooming can be a fun experience too? Not to mention that grooming is beneficial for your dog, grooming time is also an enjoyable moment to enhance the bonding between two of you. In addition, grooming keeps your furry friend in a good shape, and prevents your dog from mats and tangles, which can lead to itchy and inflamed spots on the dog’s skin. There are many professional centers that offer full grooming services for your pets, and some dog owners choose this option. However, regular visits would be quite costly over time, so it is preferable to a number of owners to do dog grooming themselves. In fact, grooming takes time, and sometimes without experience, dog grooming may be intimidating because your dog does not stay still, and it takes practice to get dog grooming done quickly and efficiently. Therefore, finding the best tools, specifically dog grooming clippers, will not only make the process easier for you but also reduce anxiety for your dog during the session. 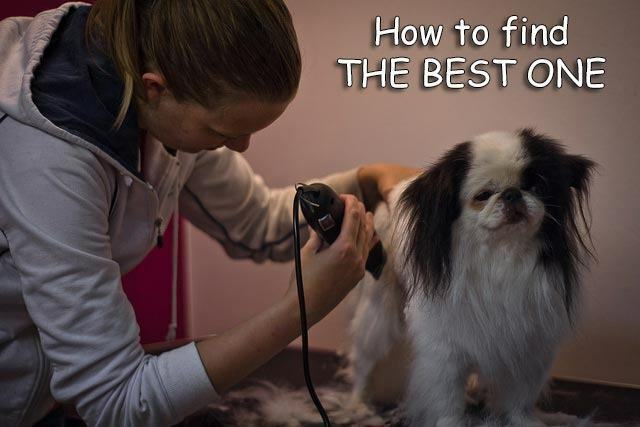 Firstly, before going further into the options, the rule of thumb when browsing for the best dog grooming clipper is to choose quiet ones. 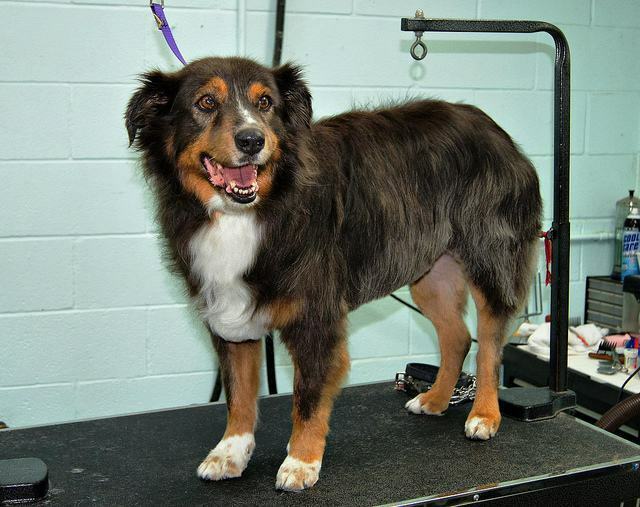 Dogs are sensitive to sounds, and a loud dog grooming clipper will make your dog more nervous. As a result, grooming time may not be as comfortable as you want it to be for both you and your furry friend. Therefore, while considering various options, keep in mind that you may want to find a quite clipper for the sake of your pet. There are two major types of dog grooming clippers: corded and cordless. Corded clippers are electric-powered, while cordless ones are battery-powered. There are advantages and disadvantages of each type, and it totally depends on your need and want when you decide which one works best for you. Corded clippers are strong, and you never have to worry about its power source. Once you plug it in, it will work smoothly without any power interruption during grooming time, until you switch it off. However, corded clippers are inconvenient due to the attached cords. The cord makes it difficult to move around or move far from the wall sockets. Moreover, your dog might mess around with the cord and make it tangled. On the other side, cordless clippers obviously do not have any cord attached to them. You can freely move it around and take it with anywhere, independently from electrical outlets. In fact, they are powered by battery, which may run out while you are grooming your dog. This is the biggest disadvantage of cordless clippers. Powered by battery, a cordless clipper may die while you are in the middle of clipping, and you need to replace the battery. It can become a frustrating process if the battery is out at wrong moments. So, now you understand the pros and cons of the two major clipper types. It is totally your call to decide which one is best. If you prefer convenience and freedom to move around, a cordless clipper is definitely the best option. Inversely, if you prefer a smooth process and dislike the hassle of changing batteries, you should get a corded one. The next criterion that you need to consider is the clipper’s speed. Some dog grooming clippers only have one speed, while others have two speeds or more. The speed here is the speed of the motor operating the blade. To identify which type works for your dog, you should first determine the thickness of his coat. If he has a thin coat that requires light trimming, a single speed clipper would be adequate. On the other hand, if your dog has extremely thick undercoat, you should choose a multiple speed clipper. The rationale behind choosing single speed or multiple speed is that for thick coat, the motor needs to work harder or faster to trim various layers of fur. With single speed, you cannot adjust the speed of the motor. If the default speed is inadequate for your dog’s coat, the blade will quickly become dull after a few sessions. After that, the clipper can no longer function and you may end up buying a new one. Therefore, choosing the right type is essential in order to save money and get the best values. Last but not least, dog grooming clippers are available in several types of packaging: individual clippers or clipper sets. You can buy each clipper individually or buy an entire set with additional parts for replacement. Once again, no option is better than the other. It is completely your choice and your needs to decide which one is the best, and here are some insights to assist you. If you only have one dog and you know exactly which type of clipper works best on your dog, an individual clipper should be enough. There is no need of spending extra money on parts that you will not use. On the contrary, if you have many dogs or one dog that has different lengths of coat in different body areas, a clipper set would be the best bang for the buck. Usually there are various blades included in the set for you to replace. Therefore, you can switch between the blades depending on which dog you are grooming. Overall, finding the best dog grooming clipper would not be complicated at all if you remember the tips and criteria above. If you are overwhelmed by the enormous amount of different brands and types, you can start with these basic criteria to limit your options, visit https://crittersitca.com and do some research, then picking your most favorite one with an affordable price should be a good way to go. We understand that choosing one among thousands of options can be stressful, but hey, just remember that it’s all about having fun with your four-legged friend. It would not be fun if only your dog enjoys the moment; you have to enjoy it too. So, take your time to choose the one you like that fits you the best, not necessarily the most perfect one in the market. And if it is still too difficult and overwhelming, a professional service is always available for you (but we know you’ll be able to find a clipper for your dog). PUPPY PROOFING YOUR HOME BEGINS with controlling your pup’s environment by actively supervising him—or by restricting him to a safe place where he can’t be hurt and can’t do any damage to your home. your puppy will not feel abandoned. favourite toys. This is your best opportunity to begin crate training. Give your puppy a chew toy and treats. Start with short periods in the crate with the door open. Then, try closing the door for longer periods. him a treat. This way, you reward the quiet behaviour, not the whining. need to be let out to eliminate at night for the first few weeks. MANY PEOPLE ARE FAMILIAR with muzzles as a device for bite prevention, and they tend to have a certain stigma attached to them. A large part of this negative image seems to be due in part to the appearance of a dog wearing a muzzle. Some people are of the opinion that only ‘bad’ dogs need to wear muzzles. This is unfortunate, since, when used correctly, muzzles are very useful tools that can make you and your pet more comfortable. Muzzles can be used as training tools as well as in situations that may be troublesome or intimidating for your pet. Which kind do you need? There are several different types of muzzles available, depending upon your specific needs. There are basket muzzles, which prevent biting and chewing, but still allow your dog to bark and pant. Then there are the more typical snug-fitting muzzles which are made from a variety of materials such as leather, neoprene or vinyl. In general, these muzzles prevent barking as well as biting and chewing. If the muzzle is sized appropriately, it will still allow your dog to pant a little. Products such as the gentle leader or the haltie are not actually muzzles. As such, they do not prevent biting or barking, but they will give you more control over your dog’s head. This can make your training more effective, especially when introducing your dog to new people, animals and situations. much for their safety and comfort as it is for everyone else’s. When used appropriately, muzzles can reduce your pet’s anxiety in problem situations. If the muzzle is selected carefully for your dog’s size and needs, it will not cause your dog harm. However, muzzles should never be used without supervision, and certain muzzles should not be left on for extended periods of time. For instance, while a tighter-fitting muzzle may allow some panting, some dogs can become overheated when they are left on for too long. as well as for a product that is fitted to your dog’s breed and size requirements. You can find muzzles at veterinary clinics and pet stores as well as on the Internet. but also in deciding exactly what type would be appropriate. Consistency is the key when you begin training. Make sure you initially reward the behaviour you are looking for each and every time. The more a behaviour is rewarded, the more likely it is to occur. Use treats, toys and praise for a job well done. Instead of focusing on what your pup should not be doing, reward him for the behaviour you prefer. There should be no reprimand before education. Don’t yell at your dog for not coming when you haven’t trained him properly. Practice and repetition of the exercise is important when learning any new skill. Be patient and have fun. If frustration sets in, try a more simple exercise and call it a day. End on a positive note. Starting again the next day, when you are both in a good frame of mind, is more conducive to teaching and learning. Put a treat near your puppy’s nose to start. Slowly raise the treat over your pup’s head. As he follows the treat, he will be lured backwards into the sit position. As soon as he is in the sitting position, say the word “sit” and give him his reward. By saying the word sit as he is doing the behaviour, rather than multiple times, you will avoid teaching your pup to sit only when you say “sit, sit, sit”. this behaviour; so don’t forget to acknowledge a job well done with a scratch under the chin. Asking your pup to sit before he gets a pat, before meal times and before going through any doors is like asking your pup to say please. Teaching proper manners to any pup will set him up to be a well-behaved adult. As you progress, start to wean the treats away, and only give them on occasion. It is important to pair the word “come” with something of high value for your puppy, such as a treat or favourite toy. Put a dragline on your puppy before you begin. This is a long leash that you can step on if your pup runs off, and is used for safety. Start by calling your pup’s name, and the word “come”. Run backwards away from him a few steps while verbally encouraging him to come towards you. When he gets to you, lightly grasp his collar first, and then reward him with something special. This will avoid him coming in for his reward, and quickly running off again. If he gets distracted, step on the leash to stop him from taking a different direction, and encourage him to come away from what took his interest. Always use a positive tone when calling your pup to come, even if you are annoyed. He needs to learn that coming when called is not threatening. As you progress, stop running backwards and instead crouch down in one spot and call him to come. Continue to reward him each time he comes. Once he has the hang of coming and having his collar taken, you can start to add the word “sit”. Soon, he should only get the reward (a game or a treat) once he is sitting in front of you. Heeling means to walk your puppy on your left side, with some slack in the lead. Reward your puppy first for being at your left side. While it might seem excessive, reward him every few steps. As you progress, start to reward him each time you turn, to keep him engaged. Progress further by adding a sit each time you come to a stop (at an intersection for example). By not pulling your puppy back to you, and instead rewarding him for being beside you, he will learn that he gets his reward for being close to you on your left, rather than pulling you down the street.